UTSA phase III architecture students present their project to health care professionals. (Jan. 9, 2019) – Over the last year, students in the UTSA Department of Architecture have developed preplanning and architectural design proposals for the new psychiatric care facility of San Antonio State Hospital (SASH)’s southeast campus. This collaboration was proposed by UT Health San Antonio, which has contracted with the State of Texas to develop a high level design for the new SASH hospital. The project, made possible by a grant from the UT Health San Antonio, was undertaken by Sedef Doganer (chair) and Neda Norouzi, faculty members in the Department of Architecture. To provide students with hands-on experience and to complement their classroom learning, Norouzi challenged her undergraduate students to develop design ideas that break through the mental health stigma. >> Watch this video to learn more about the 2018 Architecture Design Studio. The project started with extensive research on best practices of psychiatric care hospitals. The students reviwed existing literature on patient-centered care, campus planning and interior spatial layouts of psychiatric hospitals as well as the needs of different demographics using the state hospital. Additionally, they conducted assessments of the hospital’s existing condition, building evaluations and site analyses to better understand the new hospital’s needs. By the end of Spring 2018 semester, phase one of the project, architecture students developed and presented eight different design scenarios to health care professional architects, landscape architects and interior designers from San Antonio firms as well as the San Antonio State Hospital members and executive committee. Phase two started in the early summer. The research team including Norouzi, undergraduate Christian Garcia ‘18 and graduate student Phu Trinh conducted one-on-one interviews with members of the hospital including physicians, nurses, administrators and staff to learn about the specific needs of each group from the built environment of the new hospital. The analyzed transcription of the collected data was the foundation for phase three. Norouzi, whose expertise and interest is in health care architecture, encouraged and helped her undergraduate students to apply for research scholarship awards. She then mentored these students through literature review, data collection and analysis and the presentation of their findings. Five students won university best research award in the 2018 Undergraduate Research and creative inquiry showcase. 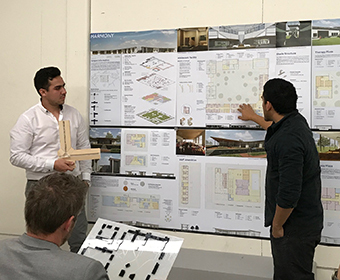 Phase three of the UTSA project included architecture and interior design students plus two more research assistants, Carlos Rodriguez-Ramirez, a graduate student, and Jose Castilo, a sophomore undergraduate student. The interior design students, taught by professor Analy Diego, worked on further developing the interior of the top four projects from phase one, while Norouzi’s second architecture studio developed an additional four design scenarios for the hospital. In this phase, Doganer and Norouzi invited guest lecturers from the local and national health care design community to lecture the students and review their projects. In all, 42 undergraduate students participated in the Spring 2018 and Fall 2018 cohorts, assisted by two graduate research assistants and two undergraduate research scholarship students. As the semesters progressed, the students were tasked with creating architectural drawings (floor plans, sections and elevations), developing 3D digital representation of interior and exterior spaces and building architectural physical model(s) correspondent with each design scenario. “Designing for psychiatric patients requires a deeper understanding of Architecture and the principle ‘Form follows Function’. This studio provided me with insight on how to better design for the end user and be aware of the impact of architecture on human psychology. I am very grateful for the opportunity to participate in this project and for the knowledge I have gained through the extensive research and design process. This studio has and will continue to strengthen my skills as an aspiring architect,” said Christian Garcia. To culminate the project, the UTSA architecture and interior design students presented their research findings, their methods and their preliminary designs to SASH stakeholders and community members. They were evaluated on functionality, safety, amenities and cost efficiency. The top three projects of all three studios chosen by local health care designers will be send out through a survey for San Antonio State Hospital members and their executive committee to vote on one top project. All of the research and the top design projects will be published in a book made available to the university. Watch this video to learn more about the 2018 Architecture Design Studio. Learn more about UTSA’s undergraduate programs in architecture and interior design. Learn more about UTSA faculty members Sedef Doganer and Neda Norouzi.